The Titleist or Pinnacle Standard 2-Ball Sleeve features a window and gives you the opportunity to showcase your logo on the balls. 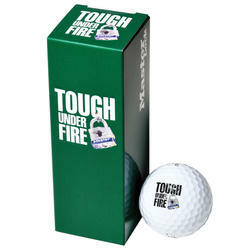 These are custom golf balls with a standard Titleist or Pinnacle 2-ball sleeve. 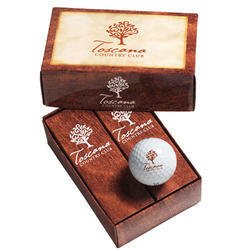 The Custom Titleist or Pinnacle 2-Ball Business Card Box allows you to promote business and your company's logo. The simple template design features your logo on two sides. A die-cut area on the top of the box allows you to insert your business card. 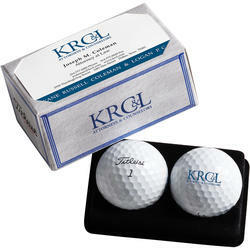 These are custom golf balls with a custom 2-ball business card box. The Titleist or Pinnacle Packedge Custom 3-Ball Sleeve allows you to highlight your logo on all four sides of the box and package 3 customized balls in each sleeve. This makes a great gift idea to hand out for any event. These are custom golf balls with a custom 3-ball sleeve. 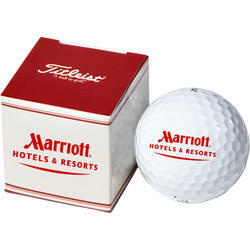 The Titleist 2-Ball Business Card Box allows you to promote business and your company's logo. 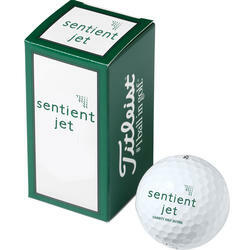 The box holds two custom Titleist golf balls and has a clear window for you to insert a business card. 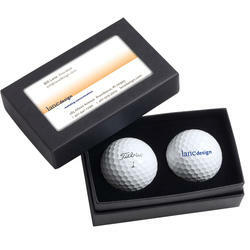 These are custom golf balls with a standard Titleist 2-ball business card box. This new packaging configuration includes 3 logoed Titleist golf balls of your choice and 5 Titleist tees packed in a clear tube. The Half-Dozen Box with Sleeves features two custom sleeves in a custom half-dozen box. 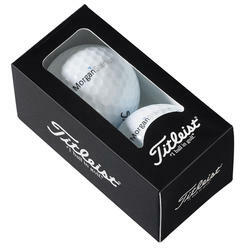 The Half-Dozen Box with Foam showcases six custom golf balls in black foam. 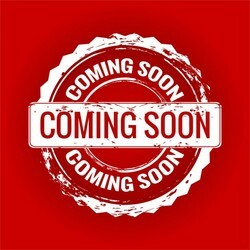 Your logo is placed on the cover and side panels. Both are great gift ideas for any special event.